Our Department established in 2015 started with 3 students in the maiden semester. The popularity of Geology needs no special mention. The increase of student strength with time is a direct indicator of the popularity of the department. The interdisciplinary nature of the department has raised the possibility of it being addressed as the Department of EARTH SCIENCES. The popularity of the subject has attracted 2 research scholars from the field of Geography. The department of Geology at JIS University provides high level quality teaching. 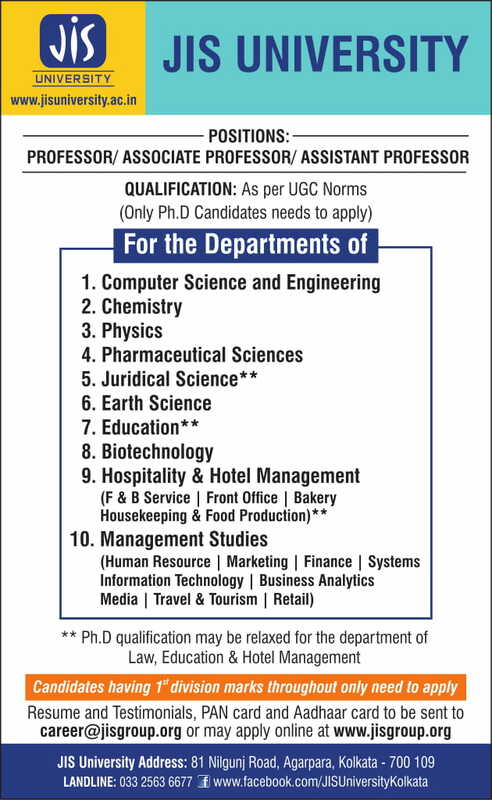 The Department currently offers B.Sc. (H) in Geology, M.Sc. in Applied Geology and Ph.D. The diverse qualifications of the faculty members ensure expertise in all aspects of Geology. Field study of Geology is a major aspect of interest. Students are exposed to studying of rocks (their structure and evolution) in insitu exposures. Departmental laboratories are equipped with the necessary equipments and facilities required for carrying out day to day practical classes and research work. Grinding machine for preliminary polishing of rock samples. Thin section preparation laboratory (in the process of setting up). Students can also qualify in NET/GATE/SET etc. and become eligible for teaching posts or opt for a research career at various renowned national laboratories like IISERs, IISc, IITs, CSIRs, NITs etc. Students can also qualify in NET/GATE/SET etc. and become eligible for taking up research projects through DST and CSIR. The Geological Survey of India has prospective offers for young geologists. Their qualification criterior is the Geologist’s examination conducted by UPSC. Interested students may go to foreign universities for their research career or various jobs related to chemistry. We have already in progress to develop state-of-the-art research infrastructure in various areas of biological sciences. Recent areas of research in the department are: Enzyme kinetics and enzyme secretion, microbial metabolism and regulation, genetic engineering, protein structure, function and engineering etc. One of our current focuses is on identification of pure herbal and/or synthetic compounds/herbal extracts having in-vitro anti-proliferative activities against different cancer cell lines, understanding alterations and cross-talks among signaling pathways in cancers. SANDIP KUMAR MONDAL Spatio-temporal changes in the lower Damodar distribution area with special reference to land use, flood and Socio-economic impact.